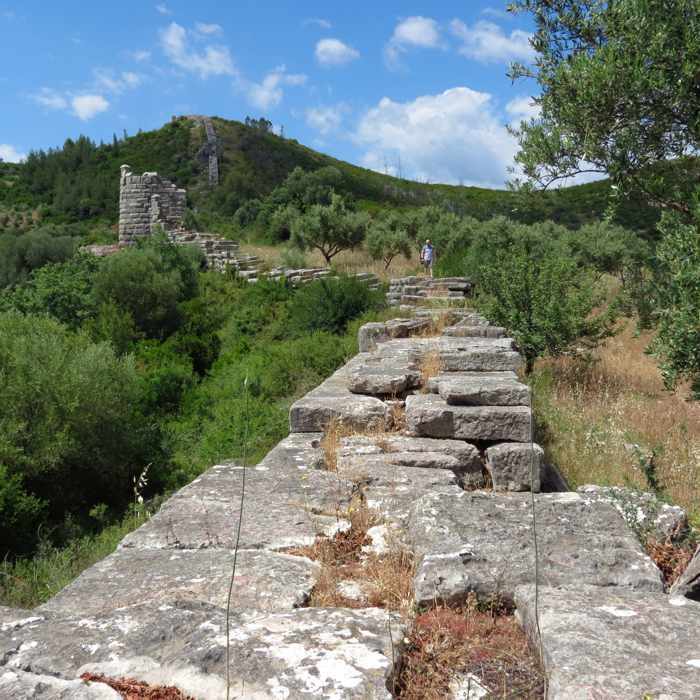 A segment of the 9.5-kilometer-long stone wall that was built in 369 BC to protect the ancient city of Messini. We walked sections of the circuit wall between three of its lookout towers. The circuit wall was built with two gates — one on the east side of Ancient Messini and one on the west. This toppled stone lintel is a striking sight at the western portal known as the Arcadian Gate. The Arcadian Gate has two entrances, each at opposite ends of a large circular courtyard. This is a view of one of the curved walls inside the courtyard. 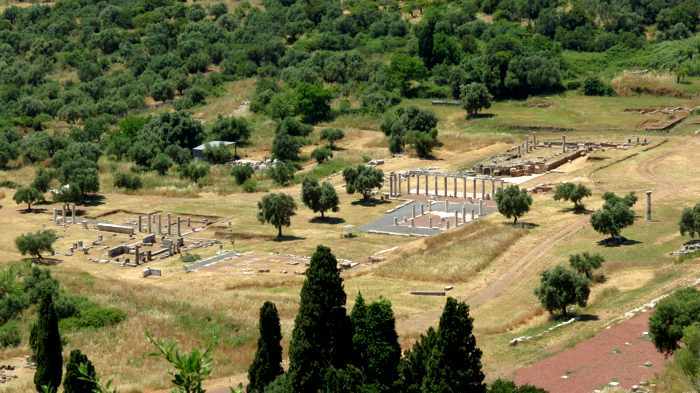 Part of the extensive archaeological grounds at Ancient Messini, which is described as “one of the most important cities of antiquity” in a listing on the UNESCO World Heritage Sites webpage. 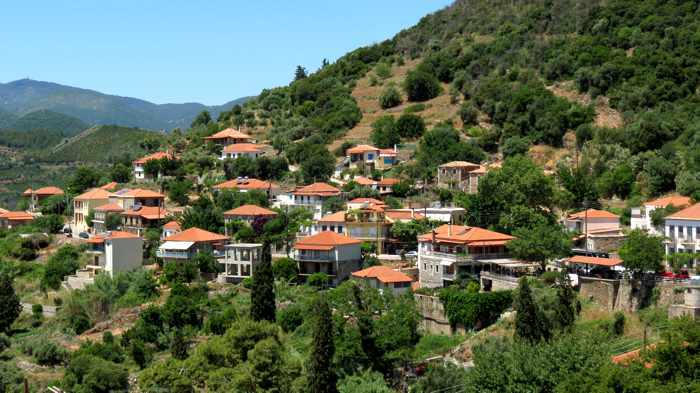 Mavromati is a small village that overlooks Ancient Messini from the lower slopes of Mount Ithomi. We stayed here for one night during our brief visit to the area in May. 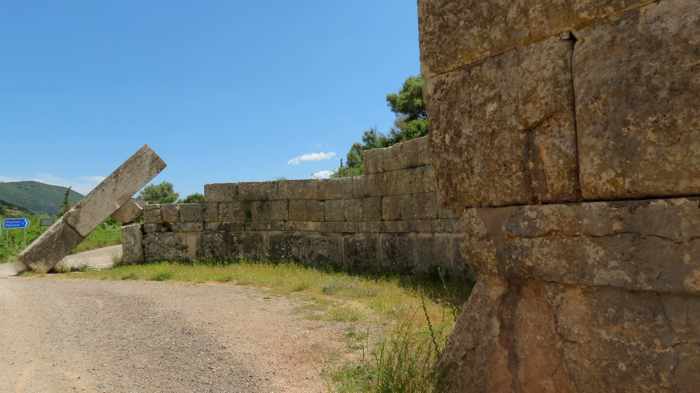 Wall walking: Suffering from jet lag and lack of sleep after a 9.5-hour overnight flight to Athens, we didn’t expect to see or do much during the first day of our vacation in the western Peloponnese region of Greece in late May. We definitely didn’t anticipate walking around a village and historic sites for a few hours in hot temperatures and blazing sunshine. 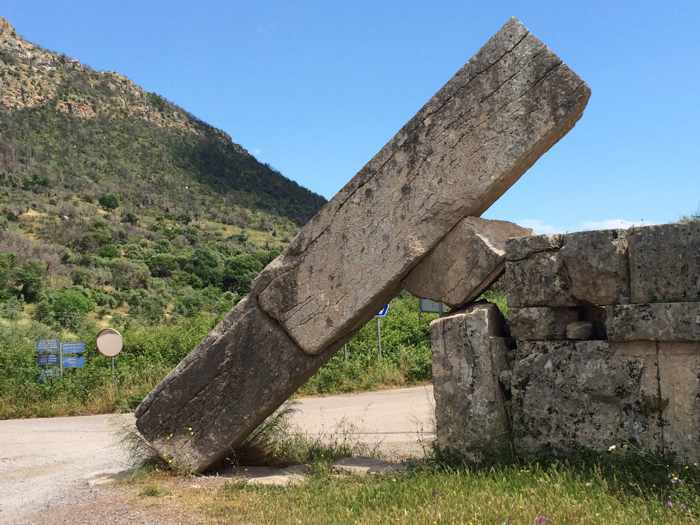 But since we had less than 24 hours to see Ancient Messini, we resisted the urge to take a nap in our hotel room, choosing instead to explore as much of the area as we could while our energy and enthusiasm lasted. Our early afternoon arrival gave us an opportunity to wander the quiet streets of Mavromati village, admire the unique design of the Arcadian Gate, walk along sections of a two thousand year old fortification wall, view parts of the Ancient Messini archaeological site, see an historic monastery, and enjoy the fresh air and countryside before tucking into a delicious Greek dinner at a taverna near our hotel. We didn’t have enough time or stamina to visit all of the area’s fascinating attractions, but we enjoyed everything that we did get to see — and loved every minute of being back in Greece. Please continue reading on page 2, where you’ll see more photos of the impressive Arcadian Gate, circuit wall, and Ancient Messini.